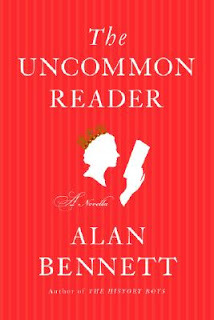 The Uncommon Reader by Alan Bennett is a witty look at how the Queen of England’s love of reading impinges on her duties and helps her evolve as a human being. There is a great deal to love about this small volume, which I first heard about on Dewey’s Hidden Side of a Leaf. I couldn’t commit full force to the Dewey’s Book Challenge, but I wanted to make mention of her and the challenge with this post since Dewey highly recommended this book when she read and bought it. At first, the Queen of England isn’t sure what to make of the traveling library that she runs across at the palace. Once she begins reading, she can’t stop and takes it upon herself to appoint a kitchen boy as her amanuensis, a writing assistant to conduct research and perform secretarial duties, named Norman. He helps her select books from the traveling library and from the London Library. She becomes so engrossed in her reading that she begins carrying books with her in the carriages and to official functions and begins to look upon her normal daily activities, like being briefed on the events of the government and world, as the “antithesis of reading” (page 21). Her speeches before Parliament became tedious and “demeaned the very act of reading itself” (page 33). It’s interesting to watch how certain members of the staff react to her reading habit and how they conspire to eliminate it. Despite all of the government’s machinations, however, the Queen perseveres. Readers will adore the end of the novel and how it turns the rest of it upside down.